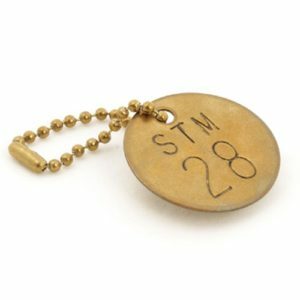 Silver Fox can produce your valve tags in a range of different materials such as: brass, stainless steel, aluminium, acrylic laser engraved or traffolyte. These can be supplied in the particular size you require with the message and/or sequential numbering. We can also supply with cable ties or metal chains, so that they can be quickly and easily fitted by the site engineer. Other alternatives include the Endurance valve tags that can be printed on site using our Fox-in-a-Box® thermal printer kit. Metal Engraved Labels are Custom Made to Your Requirements. Please Note: Suitability for particular applications such as rail or outdoor will depend on the material used. The Label Application Guide at the top of this page is for metal labels. Please check that the material you select is suitable for your particular application. For more information call our Sales Team on +44 (0)1707 37 37 27 or email sales@silverfox.co.uk.